What Makes Vooner’s Industrial Quality Liquid Ring Vacuum Pumps Different? The portion of the discharge gas that is not discharged out of the pump, but leaks past the seal clearance between the vane of the rotor and seal segment of the cone is called “Vaneslip”. Vaneslip allows high-pressure gas to enter the inlet section and therefore robs space for new inlet air to enter the pump, thereby reducing the flow of vacuum gas being removed from the process. With cast iron pumps in operation, the iron oxide (rust) that forms on the rotor and cone surfaces is physically worn away with use, increasing the clearance between the rotor vanes and the seal segment of the cone. This decreases the seal which then allows the high-pressure gas of the discharge segment to enter the vacuum inlet section of the pump. Our stainless pumps have blades that rotate without losing pressure from corrosion, offering greater efficiency. Vooner’s Cone port pumps are the standard of quality in the world market for vacuum service involving carry over of liquids or solids and having the ability to re-establish original clearances and, therefore, recovering performance. Cone port openings are large enough to allow the carryover of process liquids (including condensing spray from inlet) and erosive solids from the process. Our liquid ring vacuum pumps can handle liquids and solids. 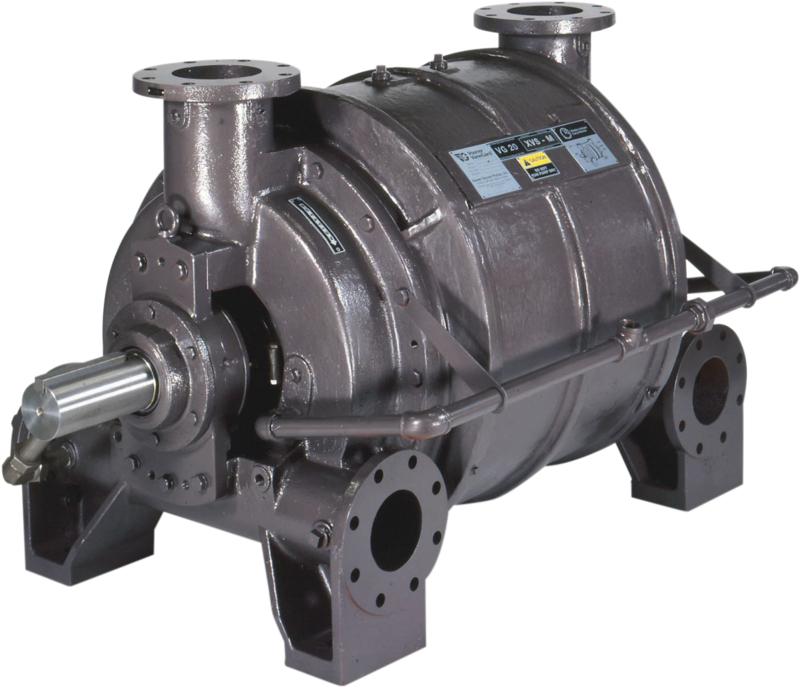 Vooner Flogard is one of the top suppliers of industrial pumps. Our experience across multiple industries helps us develop products that are both versatile and resilient across a wide array of applications and harsh manufacturing environments. Have a unique case? Contact at our engineers to get started on a plan that works for you. We work with both system upgrades and new systems. In the manufacturing industry, margins keep getting thinner. You need equipment that is efficient, affordable and durable. Our systems are designed to help you meet production efficiency targets while reducing costs. The Vooner VaneGard pumps bring a cone port innovative design to the market. It is designed to deliver a pump that delivers with peak efficiency and lower initial costs while still being designed for added pump life and reduced repairs. Center to our pumps’ advantages is its patented dual water supply system. This reduces the amount of fresh water your operations require and lowers utility costs. The VaneGard uses a self-aligning, removable bearing carrier. This innovative design speeds maintenance and reduces downtime. Always engineered with an eye on longevity and long-term operating costs, we use stainless steel components designed to extend the pump’s lifespan and minimize life-cycle cost. We use a bolt-in design that reduces shipping costs and helps this system bolt directly into your existing system. Our replacement liquid ring vacuum pumps get you back into production more rapidly. We follow up with extensive technical support and analysis team to help your maintenance team get set up with the least amount of hassle, frustration, and delays. Vooner will bring our test equipment (orifice plates or test manifold) to your plant and perform an orifice test on each liquid ring vacuum pump (Vooner, Gardner Denver…etc). The data collected is utilized to compare the current dry air performance of your existing pumps to the original manufacturer’s marketing performance curve. A written survey report will be provided.